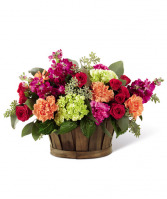 Send this colorful gift basket of flowers to your favorite garden lover or flower-loving grandmother. Like a miniature summer garden, the fresh cut flowers will brighten her kitchen counter, bedside table, coffee table...any of her favorite places! 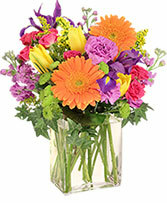 It's hand delivered by a local florist for an extra special touch. 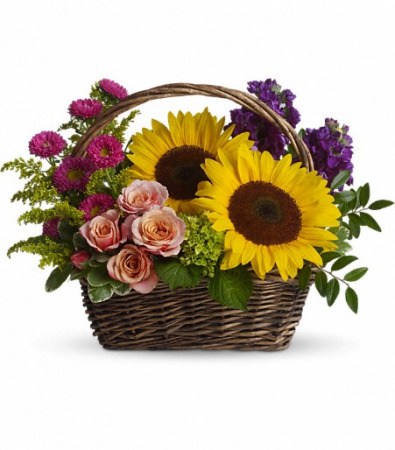 Large yellow sunflowers, peach roses, purple stock, miniature green hydrangea, and hot pink matsumoto asters are presented in a rectangular handled basket. Greens include solidago, huckleberry and variegated pittosporum. Sunflowers, Spray Roses, Matsumoto Asters, Stock, Green Hydrangea, Huckleberry, Verigated Pitt.